By the death of Captain James Laverack of 65, Marshfield Road, which occurred in hospital yesterday, Goole, has lost one of its best known seafarers. 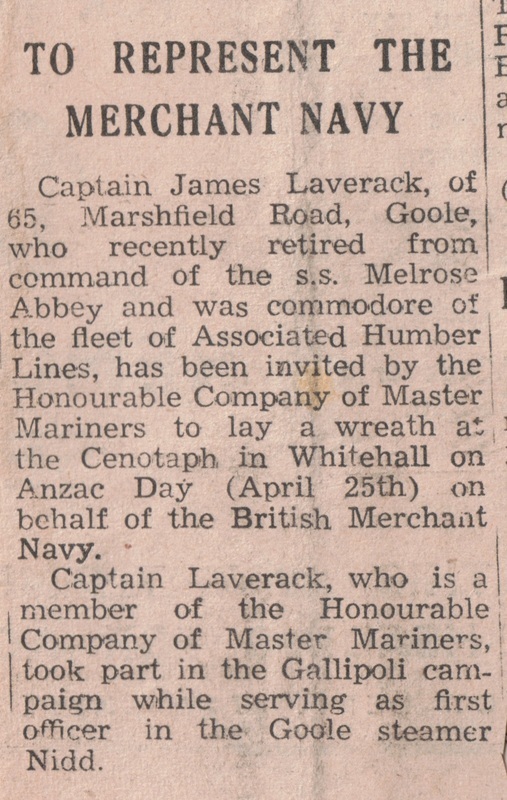 Captain Laverack, who had been in ill heath for some time, was 68. An old boy of Hull Sailors’ Orphan Homes, he first went to sea at the age of 14 as an apprentice in the Goole steamer Riplingham, and retired 50 years later in July 19533 as Commodore of the fleet of Associated Humber Lines, as a member of the Honourable Company of Mater Mariners, as a brother of Hull Trinity House, and master of the Hull Rotterdam passenger steamer Melrose Abbey. On completing his apprenticeship, Captain Laverack obtained his second mate’s ticket in 1908 at the age of 18, and joined the Meek steamer Brantingham, later serving in the West Hartlepool steamer Manchurian in the American trade. In 1910 with his mate’s certificate he joined the Furness line sailing out of Bristol, and in June 1913 he obtained his master’s ticket and joined Goole Steam Shipping, remaining with them and there successors until his retirement. His first ship with them was the Hodder, in which he was second mate, but at the out break of the First World War he was in the Nidd as first mate. 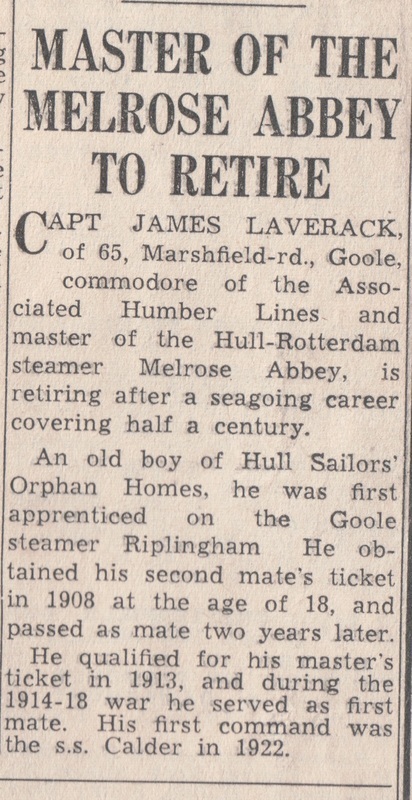 Captain Laverack received his first command in the old steamer Calder, in 1922. 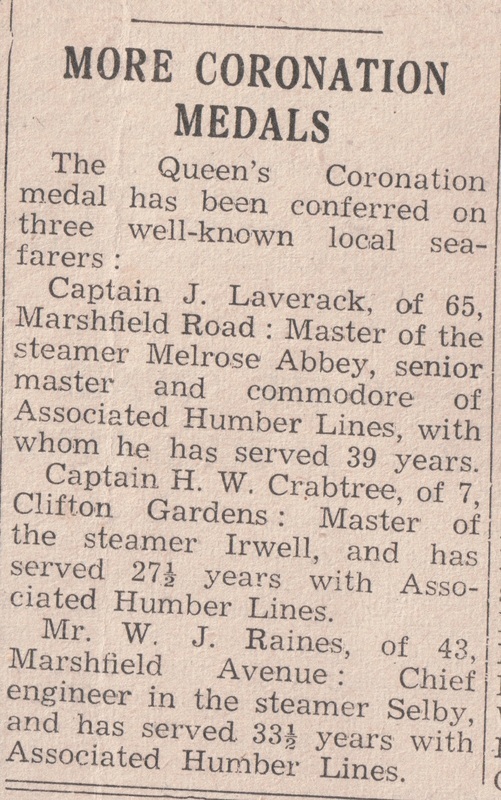 From then he served as captain in all the vessels in the fleet except the Dearne, and during the 1939-45 war he was master of the Blyth, running between Scotland and the Orkneys and Shetlands. 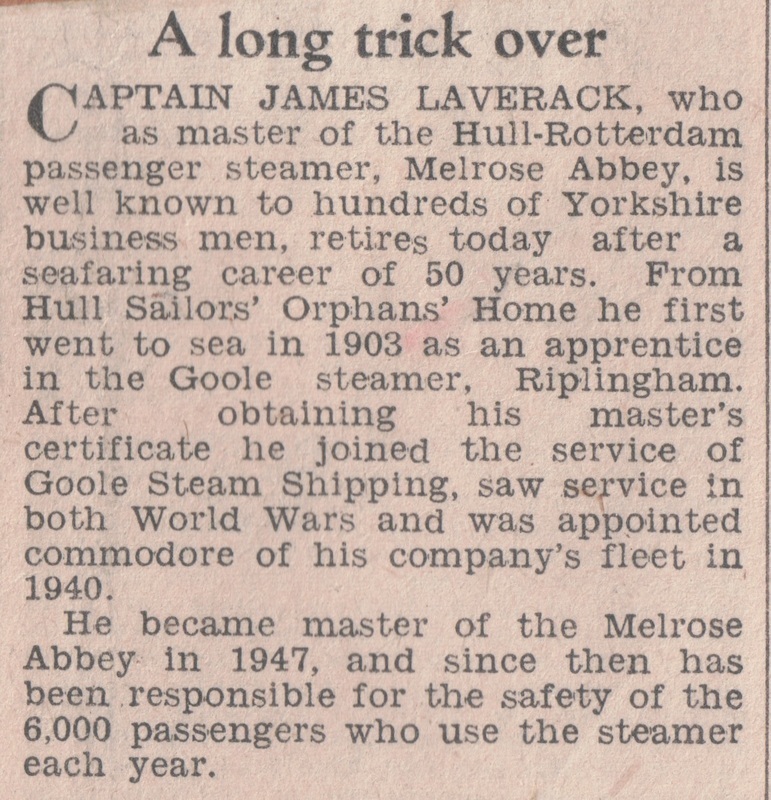 In April 1947, Captain Laverack was appointed master of the Melrose Abbey, to become responsible for the safety of more than 6000 passengers who used the Hull – Rotterdam crossing every year. 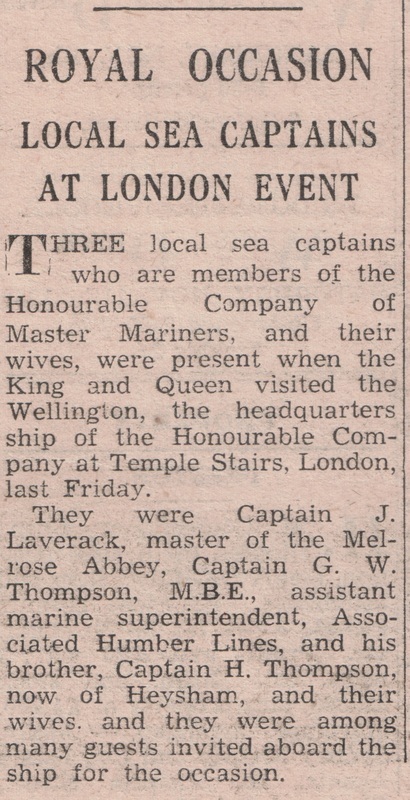 In 1940, as senior master, he became Commodore of the A.H.L. fleet. Captain Laverack is survived by his wife, a son, and daughter. 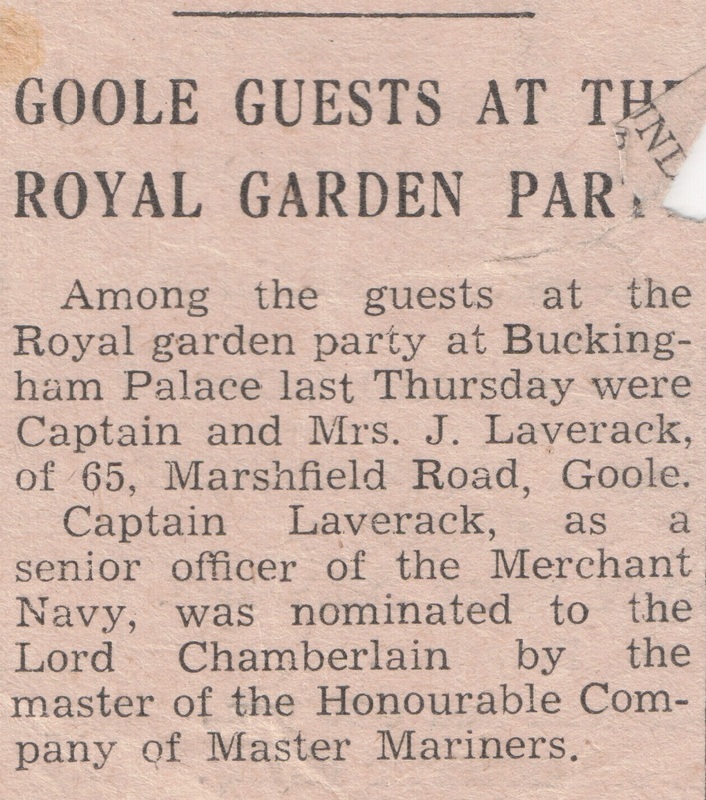 Interment will take place at the Goole Cemetery on Monday the 44th anniversary of Captain Laverack‘s wedding – after a service in the Parish Church. 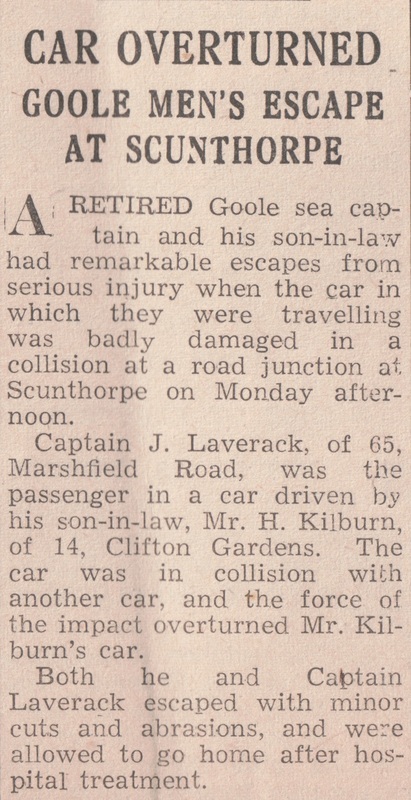 Interment of Captain James Laverack of 65, Marshfield Road, Goole (whose death at the age of 68 was reported in our last issue) took place at Goole Cemetery on Monday; a service at the Parish Church preceded the committal. The vicar (the Rev. R Hanson) officiated. 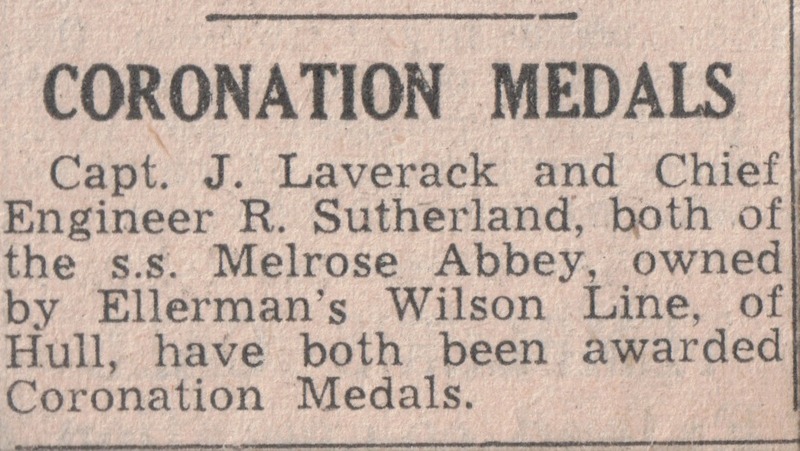 Immediate mourners were: Mrs Laverack (wife), Captain and Mrs J W Laverack (son and daughter-in-law), Mr and Mrs H Kilburn (son-in-law and daughter), Mrs W Brogan, Mrs A Chappel, Mrs E Laverack (sister-in-law), Mr and Mrs H Bringham, Mr and Mrs J Laverack, Hornsea, Mr and Mrs E Marshall, Mr and Mrs Oliver, Linton, Mr and Mrs D J Taylor, Mr and Mrs A C Coward, Mr and Mrs A Chappel, Mr and Mrs W Brogan, Mrs J Blackburn, Mrs P Darragh, Mrs H Martin, Mrs J Coult, Mrs J Hardcastle, Mrs V Harrison, Mr S Chappel (nephews and nieces), Miss Jean Blackburn, Mr Terence Harrison, Mr and Mrs Hudson, Councillor and Mrs C R Ingleby, Mr and Mrs H Fawbert, Mr and Mrs A Turner, Mrs I Sutherby. 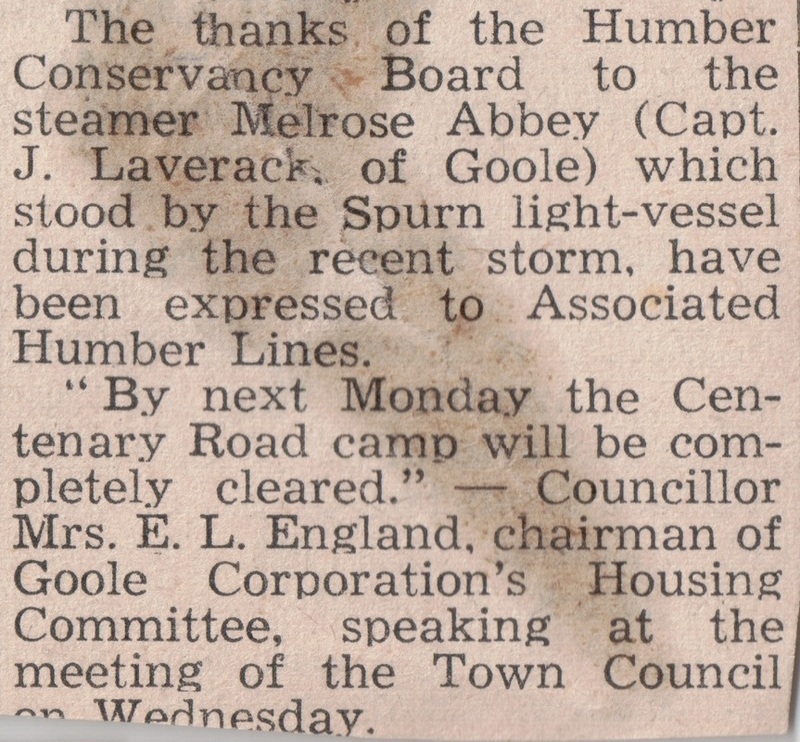 Mr and Mrs J Airey, Mrs K Anderson, Mr H Colbridge, Mrs G W Rooney, Mr H A Thurlow, Mr A Best, Mr and Mrs P H Earnshaw, Mr and Mrs C P Wadsworth, Mr A Browie, Mr R E Taylor, Mr B McClelland, Mrs N Barker, Mr and Mrs C Yorke, Mr R Smith, Councillor and Mrs J G Crawford, Alderman R Jolley, Mr H Lord, Mr T J Daniels, Mr Macintosh, Mr J A E Hart, Mr and Mrs G Howard, Mr G Isle. A collection was taken at the church for the Sailors’ Children Society, realised, with donations, £35.